A while back I saw a great post on How About Orange that involved an amazing new product called Inkodye so i snatched some up. I have been meaning to give them a go for MONTHS but just didn't plan it out. Well, I still didn't plan it out very well, but it was 4th of July and my roommate and I wanted to wear something festive when we went out & about and from what I read about the product and the projects I saw on their site and Instagram, it was the perfect solution for something quick! This DIY is supes simple, and doesn't do justice to the product, but I thought I'd give you a sneak peak at this amazing product I plan on using A TON this summer. The inks require sunlight to develop the color, so summer is the perfect time to experiment! You paint on the dye, and cover up parts you don't want to develop and pop the project in the sun for a bit. THAT'S ALL. Inkodye / A white t-shirt / Painters Tape / Scissors / Paper and a shape if you want to get crazy and make shapes! I did a little sketch of what I wanted to do first. 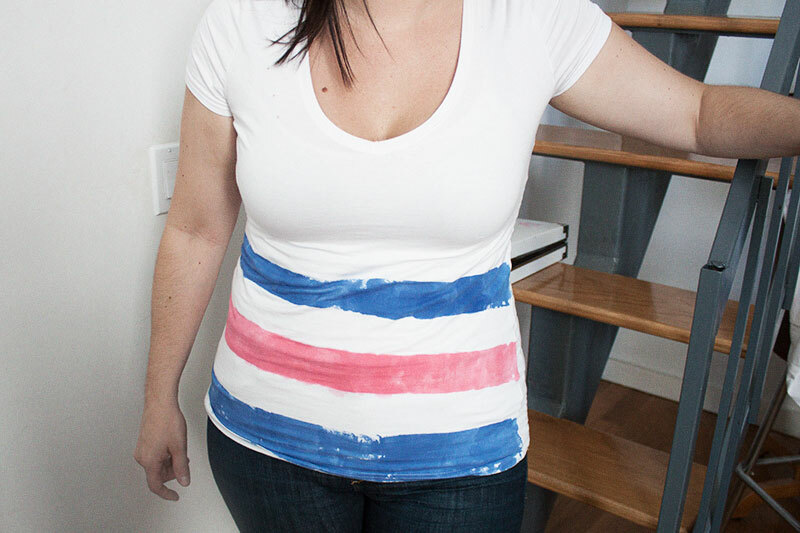 Because this was my first time working with Inkodye, I kept it simple- two blue and one red stripe, masking off the area in between with painters tape to keep it white. ... and I taped of mine! One of the many great things about this product is that you can dilute the ink a bit so that it doesn't get used up too quickly. We wanted pretty intense color, so we didn't add much water, but we did do a 1:1 ratio to stretch it a bit and we got AMAZING color anyway! When you have it all taped off, you apply the ink with a brush (we used paint brushed but a sponge brush like the one Jessica Jones used would probably work better of you want smoother coverage. Let these babies sit outside for about 10 minutes and you can see the color developing! Remove the tape and rinse under cold water immediately. Then simply wash with hot water and detergent in the washing machine and you're all done! Custom shirts in a jiffy. I can't want to try out some other crazy projects. The possibilities are endless, you can even develop photographs on fabric! Does anyone have suggestions on what else I should make? !